The first day of Summer has officially arrived, and the longest day of the year ensues. The northern hemisphere will experience 15 hours of daylight. At 2:06PM (eastern time), the sun will appear to stand still in the sky. Astronomy and nature are fascinating beyond explanation. Days like these tend to give me a restless sense; I can't seem to concentrate on any one task. I find myself thinking of the South Carolina coast and the Gulf of Mexico. The Caribbean… I'd love to climb Dunn's River Falls again. Due to a lack of both freedom and funds, I am here in Pennsylvania for the solstice. Perhaps I'll be able to sneak away to the coast in August; that remains to be seen. The trip home to Virginia to visit my folks and old friends went well. The kids and I spent 6 days there in the town where I grew up. Although I enjoy visiting, I know that I could never, not in a thousand years, live there again. It is too small, too secluded, too backward and antiquated. Everything, even human beings, require change in order to grow. The town hasn't changed at all, and it is fading into obscurity. The people that still live there can't see that fact; I suppose now that I'm an outsider I can look through the proverbial trees and see the forest of truth. Still, we have a good time when we go there. I was finally able to get together with Cecil, a friend from my childhood, while we were there. An evening with Cecil is never ordinary, to say the least. He has been putting wooden plugs in his earlobes for about three years; I've never seen the results of such a thing up close and personal before. I can't decide whether I was intrigued or flabbergasted. Despite his unique appearance, Cecil is one of the most loyal and gentle people I've ever known. 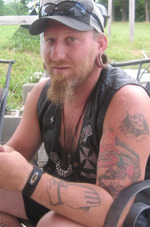 Besides being a tattoo artist, he is an adolescent counselor and just finished building a church for a local preacher. Indeed, I have proof that strange angels walk the earth. It's always nice to come back home, however. Although Pennsylvania is not where I want to spend the rest of my life, I still, as I've said before, have a purpose here. And I have friends here, some of the best I've ever had. But someday, and this I swear, I will become a true Southerner again, a coastal modern-day pirate. I will sail the Gulf and the gray-green Atlantic and drink from a tin cup chalice.